so I could dress them up in funny things. holy cute! and also, are the chairs on the counter b/c you were cleaning the floor, or so campbell couldn’t get up there. 2nd also, cute bag in the background. Click on the picture to enlarge and I think it will be quite evident why the chairs were up — nasty nasty NASTY floor. And thanks on the bag. I love it. Too bad I have to pack for a small army when I leave the house and hardly ever get to use it. Thanks for my much-needed dose of Char-humor. I love all your philosophies. I thought the reason people had kids was to ride in the car-pool lane…now I know the real reason! I should get my Bennett one of those shirts! He counts as one of the kids, right? Holy cute shirt! Where’d you get that? I got it at a very fancy store….you may have heard of it. Target. Clearly he’s been eating his spinach, just like Porter. That’s what mom’s feed their boys when they’re aiming for football super-stardom. I love the shirt. I’d get one for Porter, but then I’d be copying you, again. HEE HEE he is too cute. Love the shirt!! 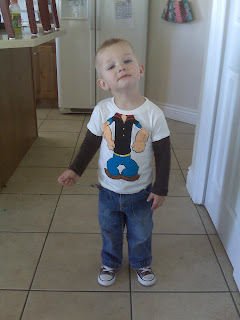 Love that shirt and plan on copying you so I can dress up my kids too! love the shirt, and the kid is pretty cute too!